These days it's not easy to find spare space for new eco-neighborhoods, so Evgeni Leonov Architects designed a series of narrow egg-shaped homes that extend from the historic Trent Villa in Nottingham. 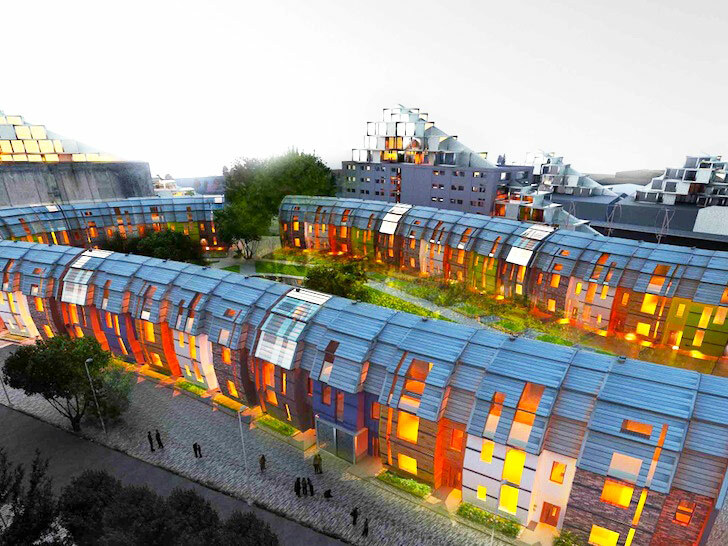 Considered to be one of the most energy-efficient forms found in nature, the egg shape served as the main inspiration for the urban regeneration project, which is designed to meet Passive House requirements. This winding housing project is organized around a central green core that is expected to promote community interaction. No cars are allowed inside the housing block and many services, such as shops, galleries and offices will be incorporated into individual homes. A common parking lot will be tucked underground. By sharing walls and deleting corners, the designer has minimized each home’s external surface, which in turn slashes the building’s heating requirement. As designed, this concept will require only 3.33 kwh/sqm each year – well within Passive House stipulations. More than just a block of houses, this proposal deliberately sets out to uplift the local community and that in itself is a noteworthy departure from the status quo. Cars are not permitted inside the block. Instead they are parked in an underground lot.